This is the Web home of George and Julie Kennedy's Nile Abyssinians in Sydney (in Australia). The Nile Abyssinians part of this website will remain for historical purposes. The Abyssinian Breeder Club of Australia information will continue to be updated. It is also the site for The Abyssinian Breeder, the Abyssinian/Somali magazine edited and produced by George until 2017, now in its 37th year (2019). The magazine will continue to be published for the Abyssinian Breeder Club of Australia members. 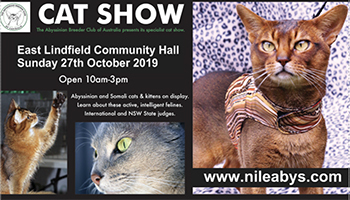 It tries to be a window on the Australian Cat FancY, with information on Aby & Somali standards; how our cat fancy is organised; state & national cat titles; quarantine regulations; and country-wide Aby & Somali contacts.